New York Times best-selling author Richard Miniter is an award-winning investigative journalist whose insights have shed light on many of today¹s most vital issues. With Disinformation he takes the popular media to task for the myths they spread about the War on Terror. Miniter has spoken to high-profile sources, sifted through countless information, and traveled the globe to learn that 22 of the most common beliefs about the War on Terror are nothing more than urban legends. If you believe there were no weapons of mass destruction in Iraq, that terrorists are likely to cross the Mexican border into America, that racial profiling of terrorists works, or that Iraq is another Vietnam, then you believe mistruths. 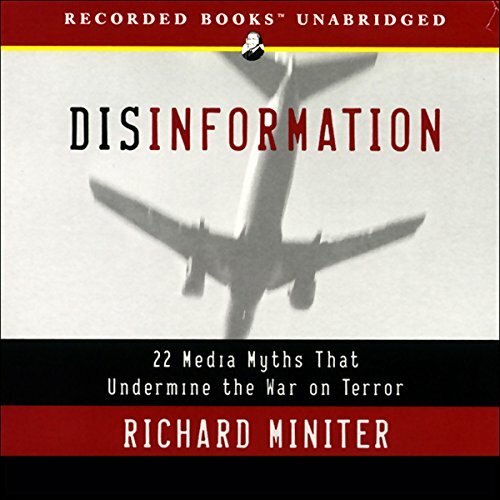 Miniter debunks these and other myths put forth by both the liberal and conservative media in this provocative and important work. This book tells the facts and if you listen to the sources the many are from left leaning to straight out far left sources. Miniter quotes from foreign sources and papers and does the work necessary to state the correct facts. I do agree the Miniter agrees with the war on terror, but the point of the book was to show how misinformed people are affecting the was on terror and its effectiveness. This book is worth the listen. I didn't finish the book but found the opening chapters to be so outdated as to be useless to finish. Liberals will hate this book! Those with thier head in the sand who think they know what the "War on Terror" is about by feeding themselves on the disinformation provided by the mainstream media will be in for a big surprise if they bother to read this book and check the facts. There has been at least one 1 star review by someone who has not read the book. Read the book, check the sources, then rate the book. This book has some interesting facts but is delivered with a very "pro Bush" bias which in my mind discredits much of the information. It is interesting and informative, just know the right bias and adjust. In reading the publisher's summary, I was given Disinformation that this book was unbiased. After listening to this book, it became clear to me that it is was just another onesided presentation of the same old information.